Book your tour in advance to ensure the availability of bikes and a guide. Check the tides for the day you wish to book on the NOAA website here. Ideally, tours begin 2 hours before the low tide or 3 hours after the high tide. There are a few small stream crossings on most routes, be prepared for wet feet; bring a spare pair of wool socks. Tours go on, rain or shine. We have some gear to outfit you, but it's assumed you'll have rain gear with you. It's coastal Alaska and rain is inevitable, bring appropriate layers. Your guide will have mid-ride snacks and extra water, however, it is up to each tour participant to bring adequate food and water for the duration of the trip. This tour begins with a beautiful drive to the head of Kachemak Bay where you'll bear witness to glaciers, mountains, and the Caribou Hills. Once at Kachemak Selo, we will ride along the beach towards Homer and continue to enjoy the splendor of the Kenai Mountains. Keep an eye out for otters, seals, eagles, and other wildlife on this tour. There are several stream crossings on this route, so wear waterproof footwear and bring spare socks! While your guide will have mid-ride snacks and extra water, it is up to each tour participant to bring adequate food and water for the duration of the trip. *Cost includes guide, fat bike rental, shuttle and some snacks. 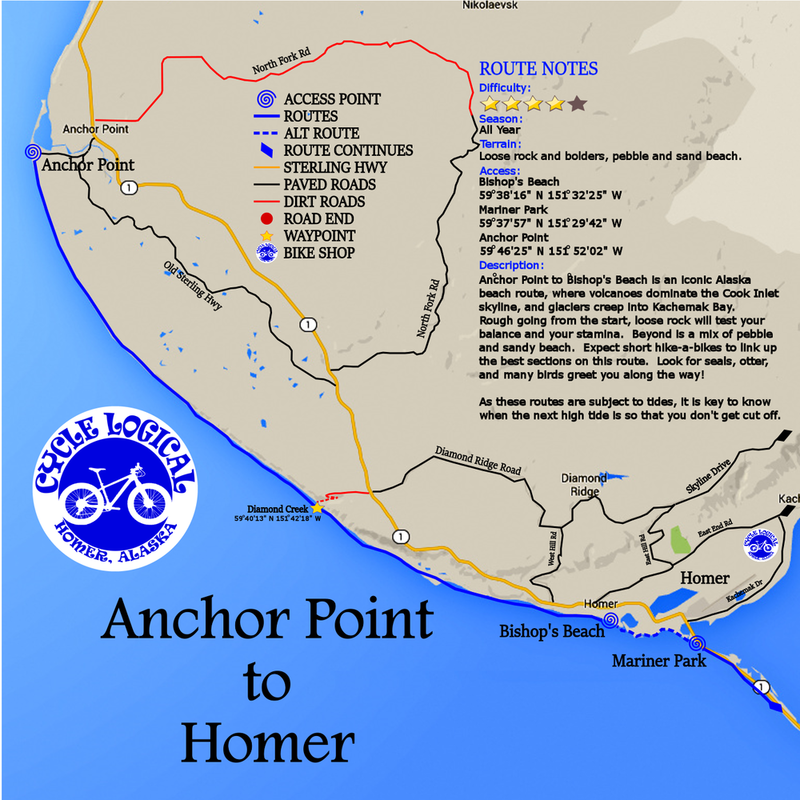 Anchor Point to Bishop's Beach is an iconic Alaska beach route, where volcanoes Illiamna and Redoubt dominate the Cook Inlet skyline, and glaciers creep into Kachemak Bay. Expect tough going from the start where loose rock will test your balance and tax your stamina. Beyond is a mix of pebble and sandy beach. Expect short hike-a-bikes to link up the best sections on this route. Look for seals, otter, and many birds along the way. From Whiskey Gulch we cruise along smooth gravel and sand beaches for the entire 16 mile round trip. As you ride, enjoy views of the Chigmit Mountains and volcanoes Redoubt and Illiamna. Our turn around is Happy Valley falls. There is one crossing at Stariski Creek along the way which can be a ride through or a wade across depending on timing and height of the tide. If you're uncertain of your fitness for one of our through-rides, but still want to get a local's perspective, consider the "Bishop's Beach Out and Back." Starting at Bishop's Beach, we ride west, towards Diamond Creek, enjoying the emerging view of volcanoes and the skyline of the Chigmit Mountains across Cook Inlet. Birds, otters, and seals can be seen along the way and there's some good tide-pooling to be had as well. From the shop we will travel out East End Road, enjoying the awesome vistas of the Kenai Mountains and it's many glaciers. From the Blue Shed parking area we will ride Fat Bikes on packed snow machine routes towards Caribou Lake. Wide open views greet you every where you look. If we're lucky, the CCL Lodge will be open and we can warm up to a fire and enjoy a nice cold (or hot) beverage. Cost includes guide, fat bike rental, shuttle and some snacks. This all day trip beings with a water taxi ride across Kachemak Bay to the Jakolof Dock. From the dock we will travel inland towards the geologic anomaly of Red Mountain. At its base is a perfect picnic spot next to a quiet stream to rest up. It's a long and steep climb to the top for those who want to make the push, but well worth the vistas. And the ride down is simply exhilarating. Cost includes guide, fat bike rental, water taxi, and some snacks. This all day trip beings with a water taxi ride across Kachemak Bay to the Jakolof Dock. From the dock we will travel along the often steep and hilly coastal road to the scenic village of Seldovia.